Microstructural characterization of the white etching layer (WEL) formed during milling in a fine-grained IN100 Ni-based superalloy was conducted. The microstructure of the layer depended on milling parameters, and under typical machining conditions, where moderate surface speed was used, the white layer exhibited nanostructure character. Fast surface speed produced partial amorphization of the outermost layer. Limited notched low cycle fatigue (LCF) testing was performed, and it was demonstrated that the fatigue properties deteriorated significantly in the specimens where WEL was present in the notch-root surface. Manuscript submitted October 28, 2010. 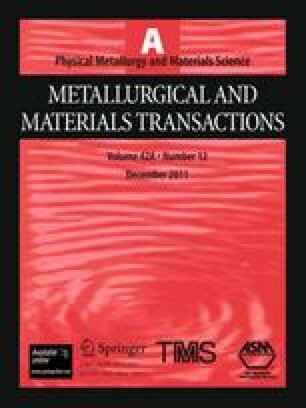 The authors acknowledge support from Pratt & Whitney in conducting this work, Mr. Michael W. Fox (Pratt & Whitney) for various phases of metallographic evaluation, Mrs. Krystyna Plonska-Niznik (AGH-UST) as well as Dr. Heinz-Josef Penkalla and Mrs. Daniela Esser (Forschungszentrum Jülich) for thin foil preparation, Dr. Aleksandre Vasiliev (Institute of Crystallography, Russian Academy of Sciences) for EELS analysis, and Mr. Édouard Proust (École Polytechnique de Montréal) for the nanoindentation measurements. The stimulating discussions with Professor Roman Wusatowski are greatly acknowledged. See Figure A1 and A2. P. Stadelmann: JEMS Java Electron Microscopy Software, available from http://cimewww.epfl.ch/people/stadelmann/jemsWeb-Site/jems.html.